In 1865 Cornell University was designated the land-grant institution for the state of New York. 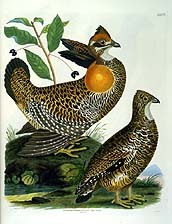 Since that date the subject of ornithology has been a major concern of librarians building the book and journal collections in support of the university's agricultural and biological sciences programs. The result of that concern is a research collection of 19th- and 20th-century ornithological literature as comprehensive as any in the nation. It is strongest in English-language materials but worldwide in scope. The bulk of this collection, some 10,000 volumes, is housed, maintained, and supplemented daily by the Albert R. Mann Library. Over the past century the emphasis of study at Cornell has shifted as ornithology has developed into a recognized science. Prior to, and early in, the 20th century, interest was strongest in the economic effects of birds on agriculture, in birds as objects of nature study and as decorative motifs, and in the development of bird classification systems. Increasingly in the 20th century, birds have played a leading role in studies in evolutionary biology, animal behavior, biogeography, systematics, speciation, physiology, migration, ecology, and conservation. The literature of ornithology chronicles the change. Because of the size and inclusiveness of the Mann Library ornithology collection, no attempt is made to list specific titles in this guide. All catalog records appear in the national library databases (RLIN & OCLC) as well as in the Cornell University Library Online Catalog. Monograph titles appear with complete bibliographic records. Serials and monograph series titles that are currently received are in the database with summary holdings. Any issue of a serial or monograph in a series that has been analyzed (that is, a separate catalog record has been made for the individual serial issue or number in the series) has also been entered in the databases.